Do you know what feels extremely good? Helping others! It is an inherent human trait it seems. We get a shot of serotonin (a “feel good” chemical) every time we help people out. We connect with them and that makes us want to do it more. Seriously, ask people who donate on a regular basis and they will tell you how addictive it is. That being said, sometimes it is a bit hard to get started. It is not that you do not want to do it, but you never seem to find the time. Well, as Chicago movers we can tell you that moving is the best time to do it! And we actually have several reasons why! While donating should not be done with the idea that you will send tons of cash if you do it, this is still a nice thing. The items you no longer use can now be a treasure for someone in need. This is particularly true with clothing. Did you know that about 50% of clothes are either never worn, or used just for a couple of occasions? The truth is that we Americans have a knack for hoarding. But this is bad for us in many ways. So you can donate your items, make them useful again and save on moving. A triple win! While donating can save you money, it can also help with your health. The very act of doing something good for another person is proven to be beneficial for your health. But to drive that point even further, you actually can get worse health if you are used to clutter. Naturally, sorting your things in order to figure out what to donate will make you cut down on clutter as well. Not to mention that you can now start anew with your next home when you move. You can literally say goodbye to clutter! While Americans have quite the cluttered spaces, we are not that fond of that clutter (as we have already seen). We actually try to order things out and throw away what we do not need. Sadly, we grow attached even to the clothes we never wear and kitchen appliances we rarely use. This is why donating is such a good thing – you do not have to throw out anything! Whatever you do not need will be put to good use by someone else. You may actually consider that a wanted gift. You are not throwing things away, you are buying necessary items for people who need them. And if that is not enough, psychologists have found out that spending money on other people helps boost our happiness level much higher and for longer. All in all, donating is good for all parties. 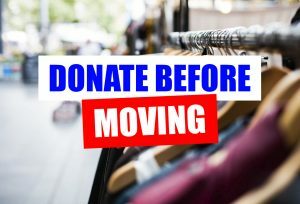 So next time you are moving, consider giving some of your stuff to charity! Moving Feels Stressful? Here Is What To Do!